Philosophy is the love of wisdom. Indeed, to practice effective leadership one requires wisdom. Certain best practices in leadership can be categorized as pertaining to one of three Hellenistic philosophies; namely, Skepticism, Stoicism, and Epicureanism. Recognize how each one translates into today’s workplace. Skepticism comes from an ancient Greek word meaning “seeking.” Socrates was a seeker of the truth and claimed to not know what he did not know, in stark contrast to those leaders who were more into “image crafting” or “impressions management” and did not know what they claimed to know. In today’s workplace, sometimes hubris is more evident in the younger professional talent pools (although in abundance at all levels), thinking that they know everything they need to know and impatiently await a promotion; whereas, many middle-aged professionals have learned the hard way that the more they learn, the more they realize how much they did not know. (German philosopher Nicholas of Cusa reiterated this concept 18 centuries later by saying, “The more we learn, the more we see how ignorant we are.”). It is for this reason of truth-seeking that Socrates taught dialectics, or the Socratic method, to the young, wealthy men of Greece. Dialectic is a line of questioning or dialogue between an idea and something that the idea isn’t. This usually entails thinking about an idea in terms of another idea or comparing and contrasting two or more ideas. To answer this question, what questions would we need to answer first? Is this the most important question, or is there an underlying question that is really the issue? Your reasoning depends on the idea that ___. Why have you based your reasoning on ___rather than on ___? Why do you think that is true? Do you have any evidence for that? Is there reason to doubt that as evidence? What led you to that belief? What do they value that makes them say that? What value underlies that view? Does that value reflect a concern for the legitimate expectations of all stakeholders? If that is the case, then what else must also be true? You seem to be approaching this issue from ____perspective. Why have you chosen this rather than that perspective? How would other types of people respond? Why? What would influence them? Socrates prized student was Aristocles; you know him by his nickname Plato, which means the “broad-shouldered one.” Since Socrates was such an influential change agent – someone who did not kowtow to hierarchy, but stood his ground as a critical analyst and independent thinker (as most professionals in Leadership Development are), he was sentenced to death by poison in 399 BC. Punishment in today’s workplace is banishment by way of termination, redundancy, or lay-off. 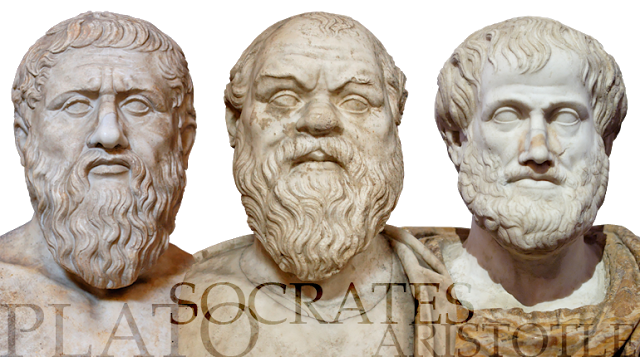 Plato opened his own school (Leadership Development practice), which he called the Academy in 385 BC. His student was Aristotle, who founded his school the Lyceum (“covered walkway”) in 335 BC. Philosophy after these two leaders became more dogmatic, i.e. telling people WHAT to do instead of COACHING them to think for themselves and seek out the answer that comes from within. This led to successive failures in civilization of people who demanded &/or adhered to rules, bureaucracy, and dictates because so many believed the “truth” was decided for them. Those who crave power create classes (i.e. various levels of management), which is the opposite of “flat management.” In today’s workplace, terminology that labels these classes are “leader” for the higher-tiered levels and “team” for the rest of the talent base; thereby suggesting linguistically that one is not a leader unless granted the title. What dangers lie in communicating to an employee that s/he is not a leader? How does this impact succession planning? Developing an employee class of “sheeple” (i.e. people who blindly follow without protest or contest, like sheep) does not encourage them to seek out their purpose – i.e. how to optimize one’s own skill sets. Those who discover their purpose either adapt to survive in a hostile environment or leave for more friendly territory (i.e. attrition rises as talent is driven to run for the hills towards companies that value their talent). Around 300 BC, Zeno founded the Stoa Poikile (“painted porch”). This was a school for the Stoics. Zeno’s philosophy was that when bad things happen, we should not let that affect us. Joan Rivers’ book, Bouncing Back: I’ve Survived Everything … and I Mean Everything … and You Can Too!, is a perfect example of stoicism, where she encourages readers to stop wallowing in self-pity and get on with life. Her stoic belief is that problems and hardships disappear when you decide to not be bothered by them anymore. It’s all a matter of mind over matter. Fate may determine things AND when you can take control of a situation, you should. Live up to your responsibilities! Baby Boomers, modern-day road warriors, and salespeople often take on a stoic viewpoint. Also around 300 BC, Epicurus set up shop with his school he called The Garden. Epicureans (and to some extent the Stoics) were interested in achieving peace and mental tranquility. These may be comparable to our modern-day remote, or virtual, colleagues who are surrounded in their own, comfortable environs – whether at home or at Starbucks, for example. Epicureans focused more on individual freedom, while the Stoics were concerned with social responsibility. Interestingly, author Daniel Pink underscores autonomy, as a major motivator in the workplace. This unequivocally appeals to the Gen Y/Millennial workforce, which places a premium on interrelatedness and the work-life balance. As talent managers, we must seek out the truth by seeing words as only approximations of the truth and not allow them to stand in the way of our understanding and efficacy. Pink, Daniel. Drive: The Surprising Truth about What Motivates Us. Penguin Group. 2009. Rivers, Joan. Bouncing Back: I’ve Survived Everything … and I Mean Everything … and You Can Too! HarperTorch. 1997. Stevenson, Jay, Ph.D. Philosophy. Penguin Group. 2013. Posted on October 26, 2013, in Uncategorized and tagged Academy, Aristocles, Aristotle, Epicureanism, Epicurus, Garden, Hellenistic philosophies, Lyceum, Nicholas of Cusa, painted porch, philosophy and leadership, sheeple, Skepticism, Socrates, Socratic method, Stoicism, Zeno. Bookmark the permalink. Leave a comment.